One of the six communities (next to Listrac-Médoc. Margaux. Moulis. Saint-Estèphe and Saint-Julien ) within the French area Haut-Médoc, which are independent appellations and may bear the commune name on the label. Pauillac is the best known of these and is located between Saint-Estèphe and Saint-Julien. Here was already in the 18th century after Dutch model the sulphurize of the wine introduced in the barrel to prevent the Nachgären. The at the mouth funnel Gironde lying town Pauillac is rightly considered the wine capital of the Médoc From this port Marquis de Lafayette (1757-1834) set sail for joining the American rebels and actively fighting there. Pauillac is the territory of Cabernet Sauvignon par excellence, nowhere else comes this grape variety (in addition to the varieties Cabernet Franc and Merlot ) in wines with typical Cassis flavor as true as here. It is the typical one Bordeaux blend of Rive gauche (left bank). The resulting red wines are dark, powerful, rich in alcohol and tannins, full of finesse and storable for many decades and are among the best in Bordeaux. The large area covers nearly 1,200 hectares of vineyards. 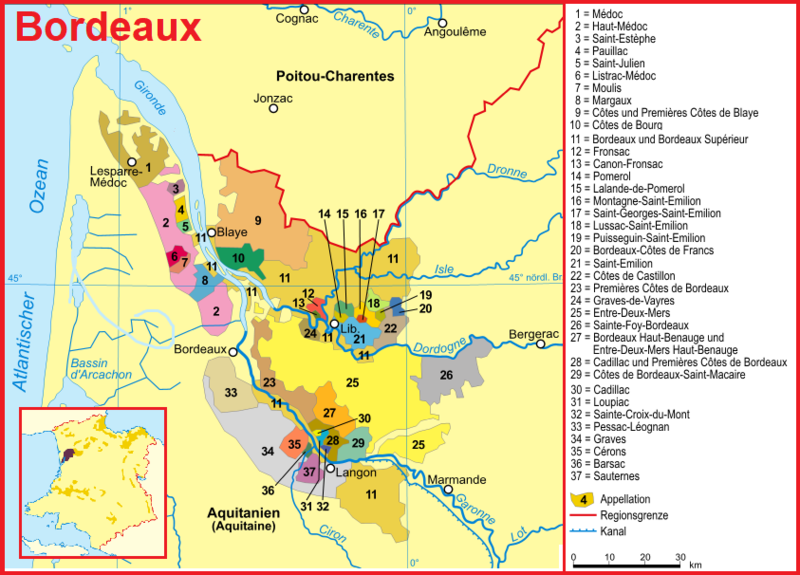 It is divided into two extensive plateaus northwest and southwest of the city of Pauillac. Both are low gravel banks with optimal water discharge, In the west, the soil consists of sand over rocky subsoil, in the center and in the south of gravel on Ortsteinschichten. It is a strip of land three kilometers wide and over six kilometers long divided by the Gaët stream. The climate is very similar to the rest in Médoc. In the Pauillac area there are a total of 18 of the 61 Châteaux that belong to the famous and still significant Bordeaux Classification 1855 were included in the Grand Cru list. These are from the vineyard almost one-third of all Grand Cru goods of Médoc. The pride of the community are the three (of the five) Premier Cru-Classé wineries Château Lafite-Rothschild. Château Latour and Château Mouton-Rothschild, as well as the two Deuxièmes (2nd place) Château Pichon-Longueville Baron and Château Pichon-Longueville Comtesse, This impressive list continues the Quatrième (4th place) Château Duhart-Milon-Rothschild and twelve Cinquième Châteaux (5th rank). Not a few of the famous wineries are named Rothschild and ségur connected.